Orrie was sitting at a long table. At the end of the table was a tissue box with a whole cut in the bottom. The side with the whole rested on the table. Grandpa Dooley was there to help out, He handed each of the “Can Dos” a small bag with 5 marbles. “Now everybody take a seat while I explain the rules”, said Grandpa John. “When I was a kid we played this game in a playground area that had a flat surface. Sometimes, when the weather was bad, we played it indoors on a long table, just like we are doing today. The object of the game is to win marbles. Whoever has the most marbles at the end of the game is the winner. The rules are : 5 players can play at any one time; each player gets 5 marbles to play with. The 6th player is the Marble Master. The Marble Master challenges a player to take a shot to win 3 marbles. 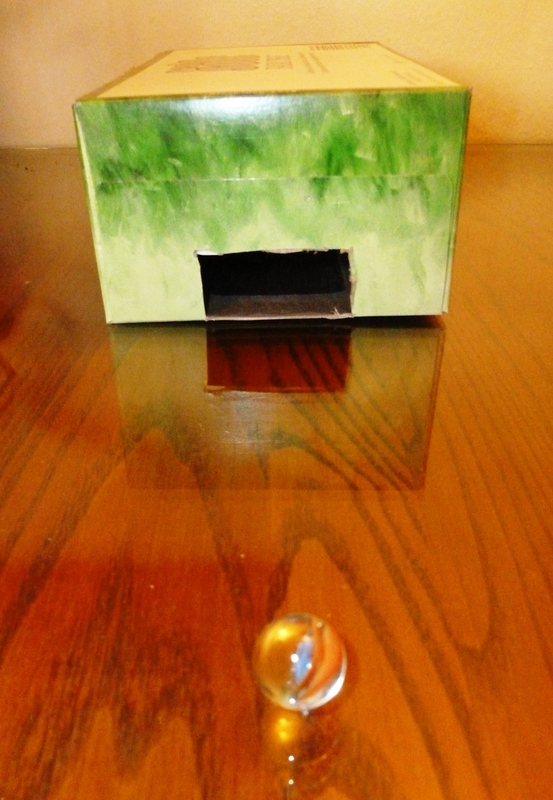 If a player gets a marble in the hole in the box, and it stays there, he or she wins 3 marbles and gets to go again, until he or she doesn’t get a marble in the hole. When a player runs out of marbles, he or she is out of the game. Now that you know the rules, let’s pick a Marble Master and play “Marbles in the Box.” The group voted for Willie to be Marble Master. Grandpa Dooley asked, “Who wants to practice flicking the marbles before playing”? Hector said, “I don’t need to practice. This game is easy” Everybody else took a few practice shots with Grandpa Dooley’s help. Hector should have taken some practice shots because he was the first player out of marbles! Arthur J. won by having the most marbles when Willie, the Marble Master, ran out of marbles. Ready to try this game at home? All you need is a box with a hole in it and marbles! Be sure to check out the marble game in the “Can Do” Club House. “Just that I lost the game,” answered Jay. “And, what’s grace,” asked Jay.